I tried to quickly ink in a sketch to watercolor, messed up the perspective badly on a building in the foreground…..and couldn’t cover it up with the paint. So I decided to use this as a scrap to play with color, and actually wound up liking the painting. Decided to crop the foreground/building out, and this is what remained! Not sure if the mountains are too busy? I like it, but there’s not much of a resting place for the eye in this one. I liked the colors of the (now cropped out) foreground, which were shades of gold/yellow. I tried to kind of duplicate it on a fresh piece and (surprise) couldn’t, but maybe another time. Happy Wednesday, and I hope you dance today! Peace. My eye is resting on the mountains – upper left. Very rocky tones and interesting texture. The hills are alive, Laura, with happy dancing for your watercolor painting. Will you frame this? You should! Your time and effort are showing in everything you do. Cheers to you and your watercolors! It looks stormy, I would be dancing id we got some rain. 😀 Very nice painting, mistakes are just opportunity. Thank you, Jodi! I’m so glad you like this. Cropping mistakes out is a win lol. :)). I’m really beginning to enjoy skies, which I wasn’t sure would ever happen. I like the colors in this painting. I added red right into the mountains and it just blended right in. I like the idea of adding color you wouldn’t necessarily see straight in. I love color, so this really appeals to me. Glad you like it! I like the movement, it really recreates the feeling of unsettled weather. And (I keep repeating myself here), great colors. I’ve done cropping before myself. Thank you. I really appreciate what you’re saying about my color sense, because I’m starting to feel I should go for a more abstract feeling in my work where any color goes. I’m going to play with that idea but I really appreciate you reiterating that. It’s helping to steer me. Thanks! Not too busy at all! It came up large on my preview screen and I was immediately captivated by the moody beauty of the composition and colors. Thank you, Teresa! I appreciate it. I think I need to do more of this kind of thing. I want color to be king, whether it’s realistic or not. 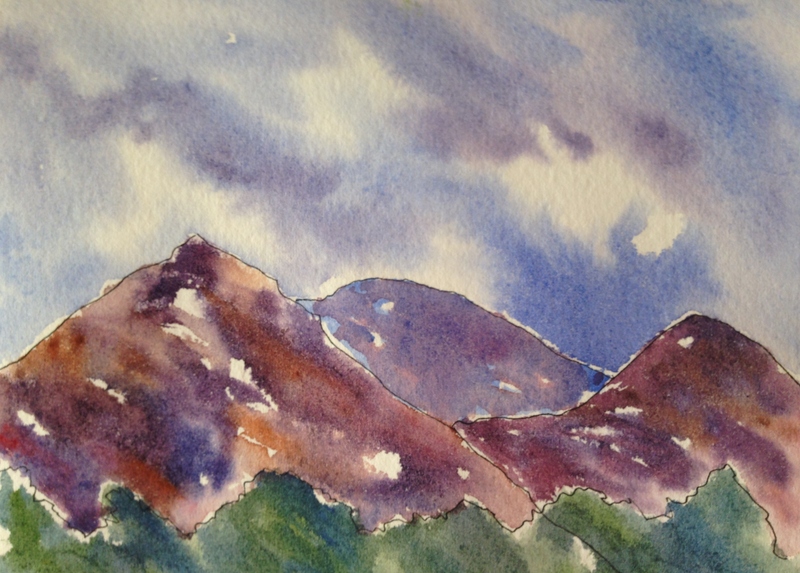 …as others have commented, there is a liveliness and energy in the mountains and sky, and a suggestion might come in the form of losing the outline (which is a legitimate technique called cloisonné) simply because it doesn’t seem necessary as it confines the mountains and trees and forces the eye to hold them back in their expressiveness. Also, aerial perspective is when things furthest away appear to fade as they recede, and it helps a painting by giving your main focus more umph. So the question for this painting is: ‘what is the focus–what is the subject’. Some painters prefer to paint their subject first and then the complimenting elements after, while others don’t. Lance, you ask a great question, for which I have no answer. I didn’t expect the sky to turn out so interestingly, and then I planned to add lots of color to the mountains. Now that the foreground was cropped out, it seems like they are warring with each other for attention. I am really bad at composition, and this was an ink drawing fail, so I really didn’t intend for it to be a painting. You make a great point as well about the ink. I took a class recently on ink and watercolor, and wanted to try out the cool pen I bought for the class (has a bit of a nib). I do like the two mediums together. But I thank you for your comment, because I start to wonder if it makes sense in a painting like this to include it. It is nice not to lose the pencil line when adding color, though. I like the mountains very much. The clouds are spectacular. Thanks, Kirk. I hope to be painting more pictures in this vein. I’m not sure what abstract realism is (exactly), but I may be veering more toward something like that. I think you do that well. I like the emotion you’re able to capture. Thank you, I appreciate that. I think color really helps me to translate that message. Laura, I like how you allowed the water colors to do what they do best. This study shows the freedom and blending nature of the water colors. Your painting adventure will continue to open new doors. Thank you, Sharon. I may be veering toward abstract realism (although I’m not entirely sure what that is lol). I just want color to be king and I don’t want to be held back because a mountain isn’t normally purple (close up), for example. And to you, my friend. Have a great afternoon. Real nice Laura – that sky draping over the mountains, awesome. I do like the colors used on the mountain – beautiful harmony with the sky. Wonderful piece – yes, frame it!! Aww, thank you Jill. You are always so joyful and upbeat and I’m so happy to get your feedback today. You know when you have one of those days? For me, they’re usually the day after everything I tried art-wise the day before didn’t really work out. lol. Anyway, thanks again, I appreciate your enthusiasm for this painting. I may start to veer into abstract realism. I just want the sky to be the limit for color. I don’t want to have to think too hard about what color something actually is. What do you think about that? You’re so good at color; wondering if you’ve had this thought too. Thank you Debi! And as to your question – nothing would make me happier!!! I’ll think of a abbrev.. version and give to you. you could even go to my artist page on FB so I can message longer? Awesome! I just posted a message to your wall. Of course, I signed up for that account so long ago that I have no idea what email address it’s linked to……lol, not sure if I’ll actually receive any notifications it sends me. 🙂 hehe! I like it a lot. It’s full of mystique. Nice texturing! I like that you receded one of the three mountains to create the depth in the picture. I like this the color and texture beautiful! You go girl! I missed this in this busy week for me. Wow. I love the color mingling you have in the mountains and in the foliage. If you would like a suggestion, if you put a thin wash of a blue glaze on the middle mountain, it would pop it back a bit and give greater depth, but i wouldn’t blame you if you left it alone. it is great!